Moorstown Castle is situated on private land a short distance from The Apple Farm. The following history of Moorstown Castle was written by Patrick C. Power. Moorstown is a townland near Cahir. Here stands the remains of a towerhouse or little castle, which was built, in the 15th century by the Keatings. The Keatings were part of the invasion forces, which came with the Anglo-Normans to Ireland in the 12th century. The name is Welsh in origin and stresses the fact that many of those who settled in Ireland during that period came from Wales and were of mixed Norman, Welsh and English ancestry. The Keatings held the manor of Shanrahan but by the 16th century they had acquired land around Cahir and were henchmen of the Earls of Ormond. A document exists from the 15th century, which describes a leading member of the Keatings as “chief of the lord’s kernty” i.e. chief of the Earl of Ormond’s kerns or household troops.The builder of Moorstown Castle may have been James Keating, who is described in 1652 as of Ballynamona, an Irish version of Moorstown, (móin in Irish long ago meant simply pasture moor and not turf or peat). In the wars of the 16th century the Keatings and all the old aristocracy of their type had plenty to occupy themselves. The insecurity of the times dictated the building of a defensible dwelling-house. At Moorstown this took the form of a strongly built circular tower and a courtyard or bawn surrounded by a high stone wall. As well as this a towered gateway was also built. All of these buildings still stand in a fair state of preservation. After the beginning of the 17th century the Keatings of Moorstown were seriously short of money. This lead to the owner, Richard Keating, seeking a large loan from a money-lender, Sir Robert Cox of Bruff, Co. Limerick, an Englishman who had settled in Ireland. Cox gave Keating £300 in exchange for a mortgage on the castle and lands. As it happened, Keating never redeemed his property later. The terrible wars of the period 1642 to 1651 gave Catholic landowners such as Keating a time of security and freedom, but Cromwell's campaign ended all that and destroyed their power for ever. The Cox family became the full owners of Moorstown and the Keatings never regained possession. When a complete survey of Irish land was made in the 1650s Moorstown was described as follows, “ ... two little orchards fenced with ditches of quicksetts in one whereof are some ash trees and likewise some cabins in the said Towne”. This is a reference to the little village around the castle at that time.In 1678 Frances Cox, a daughter of Sir Robert Cox, married Godfrey Greene, who was a retired officer in the army of Charles 1. Greene lived at Kilmanahan. He did not enjoy his new acquisition for long because he died in 1678. His son John succeeded him and years afterwards, in 1735, exactly a hundred years after the Keatings lost Moorstown, his son Godfrey was killed in a duel. The duel had its origins in the loss of the land to the Cox family. Richard Keating of Nicholastown fought with young Greene and killed him. The Greenes lived in Moorstown till 1798. A descendant of John’s, yet another Godfrey Greene, died there in April 1798. He had been Member of Parliament for Dungarvan, as well as Accountant-General to the Court of Chancery. He never married. His brother, John survived him by six months and died in the castle. He was the last of the Greene family to live there. He had been an ardent promoter of the linen trade in Ireland but his son Robert, not only did not live at Moorstown, but lived in India where he died in Calcutta in May 1818.The Greene family severed its connection with Moorstown in 1855. on the 7th of July of that year the Landed Estates Court sold the castle and land to pay debts incurred by the owners. It was ironical that it should end this way, when we consider how the Keatings lost their property in the first place. The buyer was Richard Grubb of Cahir. The castle or towerhouse at Moorstown is a circular building. This type of castle is not very common in Ireland. The commonest type is the square or rectangular building. The fine gate-house is rectangular and in a fair state of preservation, like the other building. They are built of limestone. Near the towerhouse and against the surrounding wall are the remains of a dwelling house, which may have been built in the 18th century by the Greenes. The following description of Moorstown Castle, written by Leo Wallace, is a revised version of a talk given by him at an outing in May 1988 to members of Co. Tipperary Historical Society. Moorstown Castle belongs to what Craig refers to as a small class of cylindrical tower houses peculiar to Tipperary. He goes on to try to enumerate them all (there being so few), but omits Moorstown, one of three strongholds of the Keatings in the immediate locality. 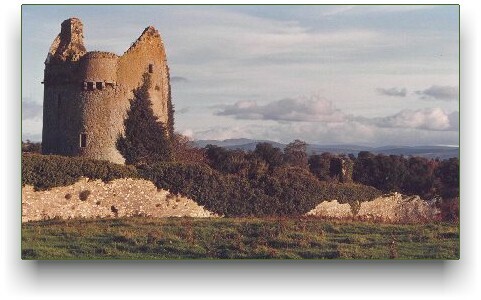 The situation of the castle and bawn complex, off the main road from Clonmel to Cahir, may explain how Craig missed it. However, the castle is clearly visible from the main road, although difficult to reach unless one knows the way. Moorstown is actually on the old road to Cahir, now a boreen, and stands on a grassy limestone knoll commanding a great sweep of land all around the site. From the eastern or western approach the tower-house, showing over the almost complete bawn wall, is a most impressive sight. It has a brooding atmosphere that is almost tangible. The bawn was possibly the first part of the buildings to be erected. Since security was the main object, the completion of the bawn would have been the first step, as it would give a secure place to shelter cattle at night - not to mention the retainers - and a safe place in which to erect the tower house itself. It would have been important not to have the building operations interrupted by the cattle and other raids, which were a constant feature of those times. Moorstown bawn has two flanking towers on diagonal corners on the north-east and south-west, which more or less cover all four walls of the bawn. The only entrance is through a complete gate-house, above which is a machicolis over the round-headed arched gateway; from here solids or liquids would be dropped on attackers! This gate had also a kind of portcullis in front of it; the grooves in which it fitted may still be seen. However, as a defensive entrance the gate-house is badly designed, being flush with the bawn wall. For maximum effect the gatehouse should have been built well forward of the bawn wall, so as to act as a flanking tower and to command all the front bawn wall. The actual opening was closed by two doors opening inwards, doubtless iron-shod and kept closed by a great beam about six inches square. This slid into an opening in the wall when not in place. The doors or gates hung on great stone hinges - still in place. The door-keepers lived over the gate, and there was also a porter's lodge in the long entrance passage - no getting through here unseen! The Moorstown bawn is constructed with double-faced limestone and rubble mortar core. Part of the north bawn wall (the outer face) was beautifully re-built in the nineteenth century, giving an unusual chance to compare the work of sixteenth and nineteenth-century masons. As indicated earlier, the tower house of Moorstown is cylindrical and standing to its full height, having two gables flush with the main walls and both gables gracefully curved to the angles of the main walls. The gables are roughly facing east-west, with the eastern one finishing in a simple oblong chimney. The tower is of four storeys including the ground floor, with one vault of a domical shape and beautifully built. There are only very small window openings at ground and first floor levels, making this part of the building very dark and gloomy. One small window is of the fifteenth-century (ogee) type, showing that at least one mason had a weakness for this lovely (if old-fashioned) style, in a building otherwise very much of the sixteenth century. The ground and first floors follow the general shape of the castle, being thus circular. The second floor, in which is the main living room, is almost square, with a typically sixteenth century fireplace of the flat lintel type, with rounded edges, slightly chamfered. Directly over this room is the third floor. This appears to have been a dovecote, doubtless to increase meat rations during the hard winter months. Windows in the top rooms are all small simple oblongs with one exception, that of the main living-room. This is about four feet square, and had one mullion. There are two other smaller windows in the living-room, all perfectly plain without a single hood moulding. Nevertheless, the general effect is pleasing. The spiral stairs, garde-robes and inner doors are all beautifully fitted in between the square of the second and third floors and the curve of the main walls themselves. Over the third floor rise both gables with wall walks and three machicolations at opposite angles, liberally pierced with musket loops. There are also musket loops at ground level and on either side of the entrance door to the castle. The parapets of Moorstown are finished plainly, with no stepped battlements on the tower or the bawn. However, it can be argued that the building looks best as it is, as the design of the tower would not have taken battlements. Finally, it remains to be recorded that a now almost forgotten episode in the War of Independence (1918-1921) is largely responsible for the remarkable state of preservation of the upper story of Moorstown Castle. As a gesture of defiance the local unit of the I.R.A. erected a tricolour on the topmost parapet, which from this elevated position could be seen for a considerable distance. To ensure that the Crown forces could not remove the flag without some risk to themselves, most of the upper portion of the stairs giving access to the flag-pole was removed! The missing steps have helped to prevent possible vandalism in the subsequent years.